Columbus took eight pigs on his voyage to Cuba in 1493. But it is Hernando de Soto who could be dubbed "the father of the American pork industry." He landed with America's first 13 pigs at Tampa Bay, Florida in 1539. Native Americans reportedly became very fond of the taste of pork, resulting in some of the worst attacks on the de Soto expedition. By the time of de Soto's death three years later, his pig herd had grown to 700 head, not including the ones his troops had consumed, those that ran away and became wild pigs (and the ancestors of today’s feral pigs or razorbacks), and those given to the Native Americans to keep the peace. The pork industry in America had begun. Pig production spread throughout the new colonies. Hernando Cortez introduced hogs to New Mexico in 1600, and Sir Walter Raleigh brought sows to Jamestown Colony in 1607. Semi-wild pigs conducted such rampages in New York colonists' grain fields that every owned pig 14 inches high had to have a ring in its nose. On Manhattan Island, a long solid wall was constructed on the northern edge of the colony to control roaming herds of pigs. This area is now known as Wall Street. The pig population of Pennsylvania colony numbered in the thousands by 1660. As the seventeenth century closed, the typical farmer owned four or five pigs, supplying salt pork and bacon for his table with surpluses sold as barreled pork. Finishing pigs on Native Americans corn became popular after becoming a common practice in Pennsylvania. After the Revolutionary war, pioneers began heading west and they took their indispensable pigs with them. A wooden crate filled with young pigs was often hung from the axles of prairie schooners. As western herds grew, the need for pork processing facilities became apparent. Packing plants began to spring up in major cities. Pigs were first commercially slaughtered in Cincinnati, which became known as Porkopolis. More pork was packed there than any other place in the mid-west. Pour oil in deep skillet, heat to 350 degrees. Season each pork chop, both sides with seasoned salt. In a dish, add eggs. In a separate dish, add flour, pepper, garlic powder and onion powder, mix well. Dip each pork chop in egg, then dip into flour, coat well. Carefully, add pork chops to hot oil. Cook in batches. Fry about 8 minutes, until brown and no longer pink in center. Turn pork chops once. Place pork chops on paper towel lined dish to drain. Serve warm. Enjoy! I had pork chops here in Hong Kong...they taste yummy! 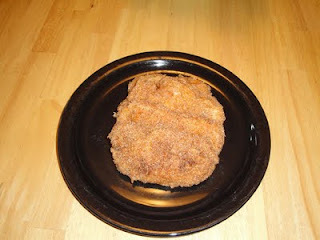 Your fried pork chops look just right for my family and the recipe is great, too! Very interesting history...as always! I had no idea why pigs had rings in their noses! Thanks! ...I lost my comment! That was a very interesting history. I had no idea why pigs has rings in their noses! Pork chop looks yummy, too! Thanks for another great one! Believe it or not I've NEVER had a fried pork chop... I feel seriously deprived now... haha! Looks great! That is one recipe that I would truly "pig out" on! The breading is so even and uniform I am jealous! Looks delicious! Thanks for the info!! These pork chops look amazing!! We love pork chops here - they are a staple! Great post! Personally, I don't think there's anything better than a fried pork chop. I've never made them myself since I've always has a mom around to do it for me. These look soooo yummy! Thanks for sharing the information about them and your recipe. Have a great weekend!